The Smoky Mountains always amaze me and it seems the place I retreat to when a breather is in order. Be sure to check out my photo and the banner on my Twitter page. My photo was taken at Clingman's Dome, the highest point in the park. The banner is a photo I took in Cades Cove, one of the last remaining holdouts before the US government annexed it into the Smoky Mountains National Park. The Freight Forwarding report is almost finished. In fact, it will be completed and reviewed by our boss who happens to be enjoying the Welsh outdoors this week. Once approved, it will be published on July 31st. Also for this week will be to catch up on updating Dashboard charts and outlining the next report - Asia Pacific Logistics. Reckon a new blog post is also in order, lots of topics to think about! That's about it from here. 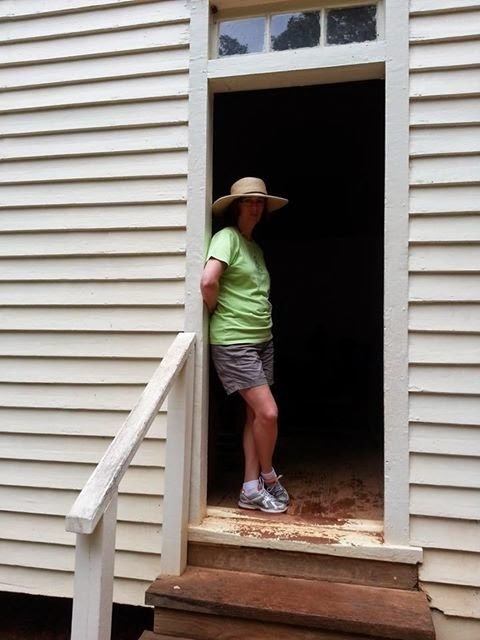 Below is a photo Chris took of me in the doorway of an old Church in Cades Cove. For those folks close to me, many will get this photo - My background is in History and I've always had a love for old Churches and cemeteries. Enjoy the week ahead and be sure to check out Ti's blog, my blog and our Twitter accounts: @TransportIntell and @cmroberson06 for additional logistics news.